View Large Image Description: Now Includes All 20 Mysteries! 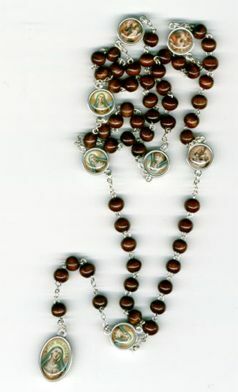 An JMJ exclusive--the best value for a Mystery Rosary anywhere in the marketplace! 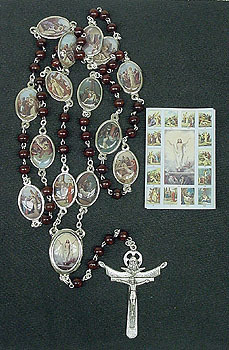 This 23" long 6mm glass bead rosary features the Mysteries of the Rosary (including Luminous, Glorious, Joyful, and Sorrowful) on silver-plated bars, a 2" silver tone crucifix, and a special Madonna centerpiece. 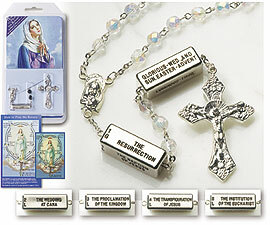 A 6-page Mysteries of the Rosary booklet and detachable holy card printed with the mysteries on the back are also included in the handy, resealable snap package. The rosary is available in Black or Crystal Aurora Borealis beads. -- OUR LOW PRICE - just $15.95!